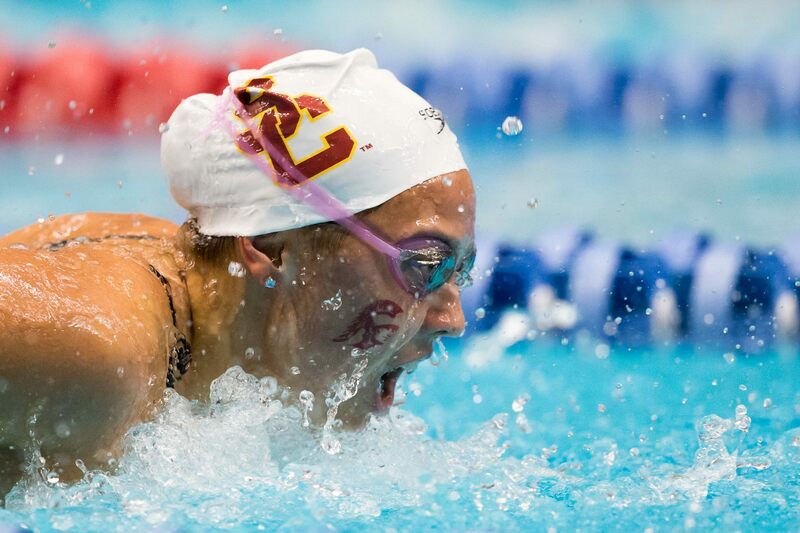 USC junior Jasmine Tosky has announced her retirement from competitive swimming on the same day as the pre-cut selection lists for the NCAA Championships were revealed without her name on them – when she otherwise would have earned an invite to the meet. Tosky is a former member of the USA Swimming National Team and was a member of the 2010, 2011, and 2012 World Championship meets, including golds in both 2011 and 2012 as a prelims swimmer on Team USA’s 800 free relays. She also placed 9th individually in the 200 fly at the 2012 World Short Course Championships. Tosky earned 5 All-American awards in her three seasons at USC. With retirement, Tosky gives up one remaining season of eligibility. It’s interesting to see two top swimmers- Jasmine and Maddy Schaefer retire before the conclusion of the season. Ultimately though, I applaud them. If their hearts aren’t in it, they made the mature decision to remove themselves from the team so the team could go on to succeed without any distractions. I knew far too many juniors and seniors who brought down the team dynamic because they were ready to retire but didn’t take the leap. Congrats to Jasmine on a great career and good luck in the future! They were teammates at PASA. I imagine they were able to support each other during some difficult times and decisions. Best of luck to both of them. I was hoping she was just in a bit of a temporary slump and could turn things around again, but I agree with what DM said. I knew something was up after she scratched B finals in the 4IM at Pac-12s. A few weeks ago I watched her swim at the USC/UCLA dual meet and she was smiling a lot. So between that and her classy announcement above, I have a feeling she’s been considering it for awhile and is at peace with her decision. As a bonus I’m really glad to hear her coaches/teammates support her, that’s a classy team. Good luck to Jasmine in her next chapter. And best wishes for USC at NC2As! USC is in the bay area??? Mr, Mrs or Miss Troll, yes, thanks for mentioning my name. It looks like I become a real obsession for some of you. And also, thanks for making me look like totally stupid and idiot. Yes, everything you said, do you believe I’m not aware????????????????????? The hard training at young ages, the stress, the pressure, the academics…. No I’m not aware of course. I know that swimmers are not robots. Thanks for that news. Please, don’t take me for a stupid swim fan.